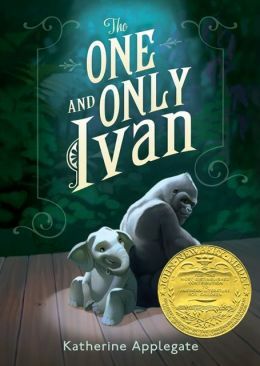 With dignity and sensitivity, Ivan, the captured silverback gorilla, narrates in his own voice in Katherine Applegate’s The One and Only Ivan. Based on the life of a real gorilla who was captured as an infant in the Congo, raised in a home until he became too large to manage, and then sent to a circus-themed mall in Washington state, Ivan’s story reveals hope and strength. In Applegate’s fictional adaptation of Ivan’s life, she creates loyal friendships with Stella, an aging elephant, and Bob, a stray dog who acts as sidekick and conscience. The janitor’s daughter supplies Ivan with paper and paints, inspiring him to practice his artistic talent; his pictures of banana peels sell in the mall’s gift shop. Although Ivan and Stella have endured years of confinement in a concrete and metal box in a shopping mall near a highway – mostly in denial of their appalling conditions, their apathetic existence changes when a new baby elephant, Ruby, initially resists and subsequently surrenders to the trainer’s claw prod. Determined to save young Ruby from the life of humiliation and loneliness that he has endured, Ivan uses his artistic talent to attract media attention that eventually leads to a new life in a zoo. The real Ivan found a new home and celebrity with a large group of fellow gorillas at Zoo Atlanta, until he died last year. Although Applegate mentions only a few of the horrors, she does not soft-peddle her views on the capture of wild animals or their isolation from their home turf in captivity. An articulate Ivan, with the soul of an artist, challenges both children and adults to consider the treatment of wild animals. I always look forward to the Newbery Medal Award. This year’s winner, as usual, is just as much for adults as for children. This entry was posted in book review, books, children's books, children's literature, reading and tagged Congo, Gorilla, Ivan, K. A. Applegate, Newbery Medal, Ruby, The One and Only Ivan, Zoo Atlanta. Bookmark the permalink. I never heard of this, but it sounds like a must for my book club! Thanks for bringing it to my attention! Starts out in a halting tone (gorilla speak) but soon gathers a good rhythm, with those insightful phrases that hit home. Enjoy!